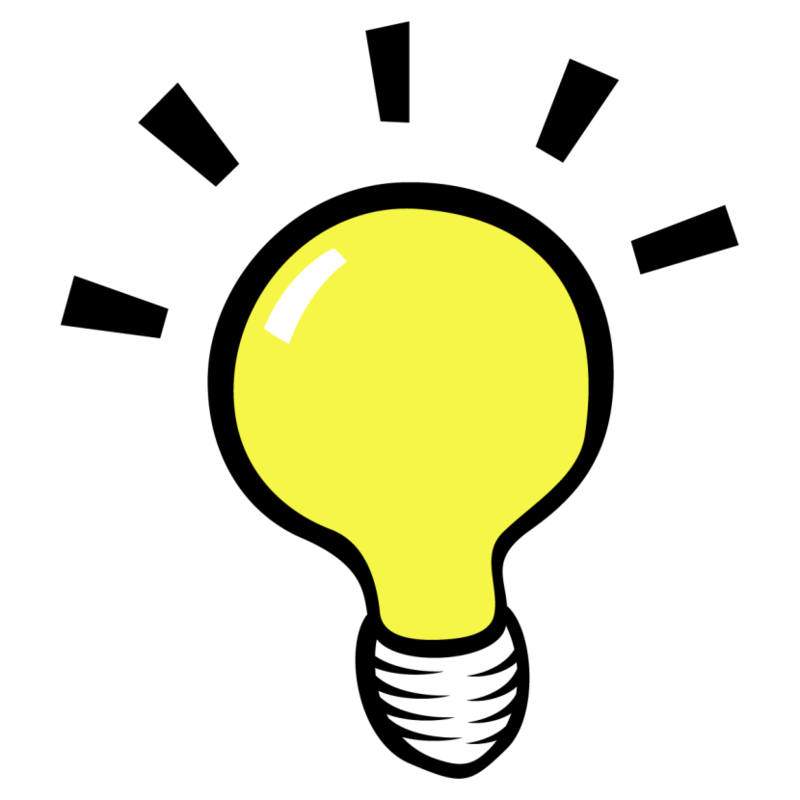 When I updated my blog post, 3 Ways To Start An Interesting College Essay, I realized I had a lot to say about how you can use action to grab your reader’s attention. So I’ve given “Action” its own post. It deserves it. First, let’s recap: When you write the intro to your college application essay you need to grab your reader’s attention. Why is it important to grab the reader’s attention? Easy. If you’ve ever flipped a channel or looked for another video because the first one didn’t catch your attention right away, you know the answer. You’ve got one chance to draw your reader in and create enthusiasm and excitement for what’s to come. Take it! Here’s a great example: Picture the opening scene from the movie “Scream.” The film begins when Casey, a teenage girl, is home alone and the phone rings. At first it seems like a wrong number and she starts chatting with the caller. But then the caller whispers that Casey never told him her name. When Casey asks why he wants to know, he replies, “Because I wanna know who I’m looking at.” That’s the moment Casey realizes that the caller is watching her. Create intrigue, excitement or suspense in your intro and you’ll make the reader excited to see how your story unfolds. You’re not writing a horror movie of course (I hope not! )—but you get the idea—Find the most interesting parts of your story and use them. Start when something interesting is happening and let the rest of the story unfold. Your reader will want to learn how it turns out. Just to be clear: You don’t have to be the best writer ever. 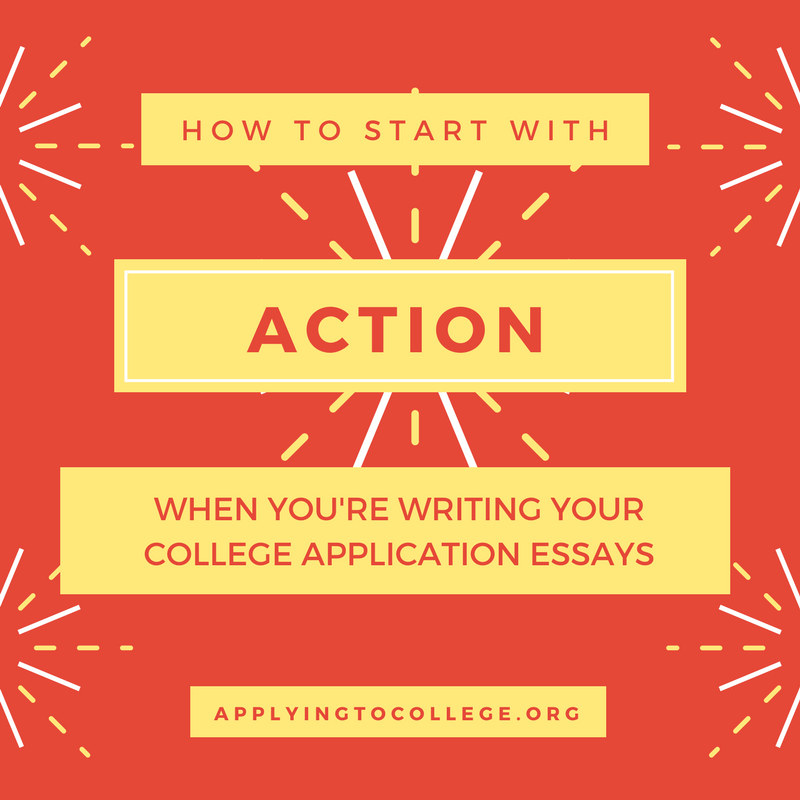 You don’t even have to use action to start your college application essay. (Remember, I’ve written about three ways to start an essay.) But you do want to interest your reader in your first few sentences. So now let’s get serious about action. Starting with the action in your story is probably the most common method students use to write college admission essays and personal statements. It’s almost a sure-fire way to succeed. Why? It’s personal. It’s unique (it only happened to you). And it can create immediate excitement and interest. There are two kinds of action or conflict: physical and mental. 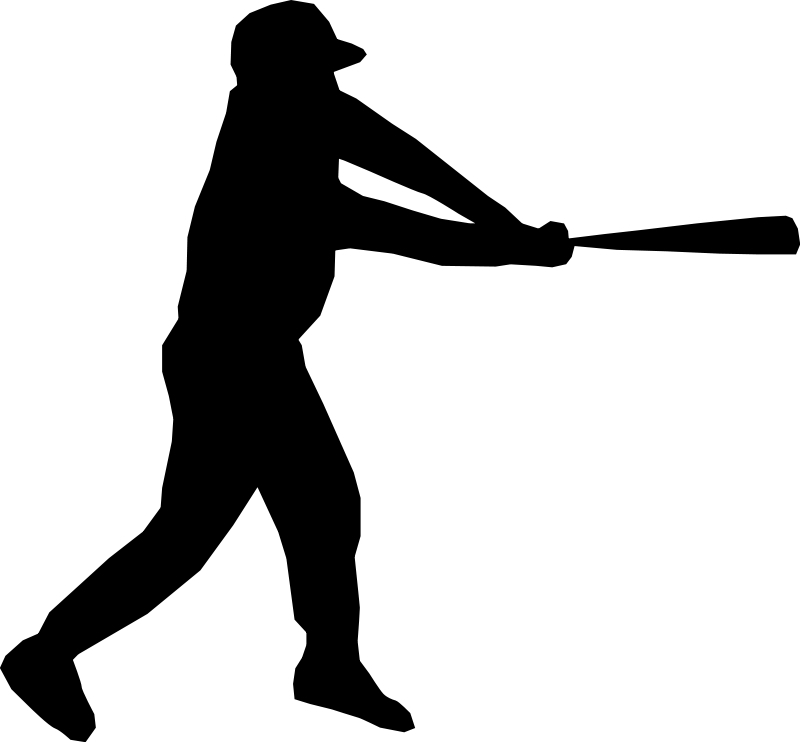 Physical Action or Conflict: This is the kind of action you can see. Something physical is happening. You’re breaking through the starting gate, tearing apart your bedroom, discovering a fossil, etc. Mental Action or Conflict: This is something you’re thinking about. You’re struggling with a decision, solving a problem, figuring out if you can go outside of your comfort zone, etc. Here are two opening sentences that use action. Notice how they both start in the middle of what’s happening. Something is happening NOW. Writing chronologically isn’t an attention grabber. Unless it’s absolutely necessary, don’t start your story at the very beginning, like the day you started school or when you came down the stairs on Christmas morning. Start at the moment you broke your arm at recess or a puppy popped out of the Christmas gift. It’s much more interesting! Tip: If you’re not sure where your action begins, write your story from beginning to end, then find the place something interesting starts to happen. It’s often several paragraphs from the beginning. Start where the action begins and give the background information later. You’ll make you reader WANT to keep reading to find out more. Paragraph one: Start with the action in your story. Paragraph two: Add some background and context to your story. Paragraph three and on: Continue to tell your story, revealing important details as you go along. Start with the action. It will help you write your college application essay in an exciting and original way. 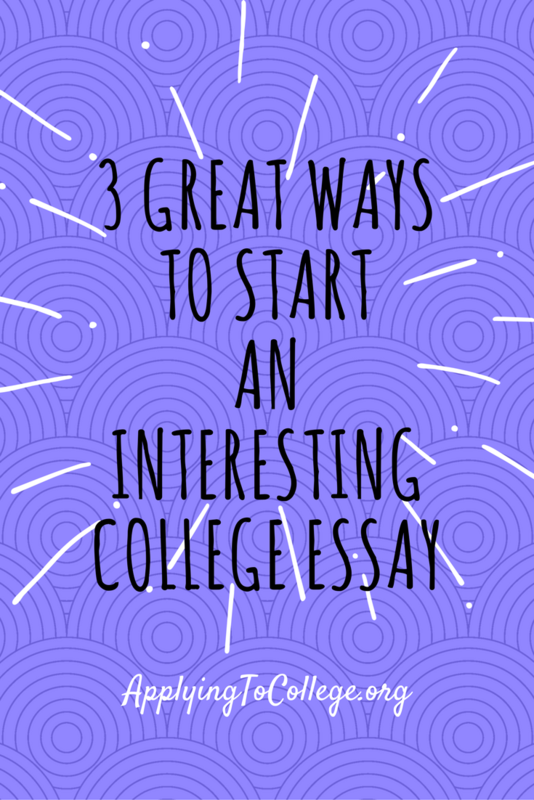 If using action doesn’t fit your topic, read about other ways to start an interesting college essay. And THAT is one way to help get your college essay personal statement noticed. 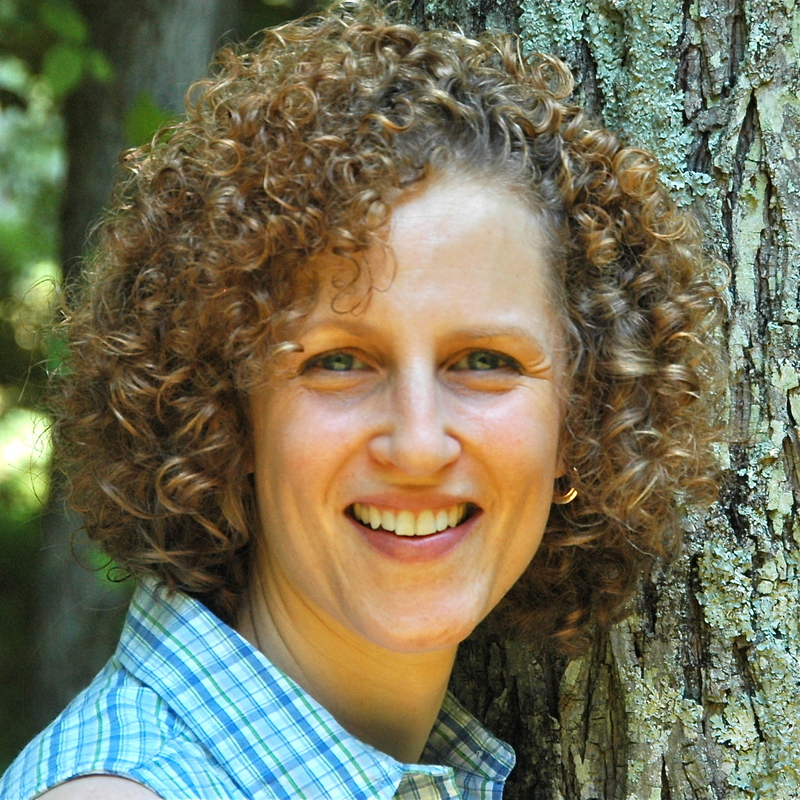 Sharon Epstein is owner of First Impressions College Consulting in Redding, Connecticut. A Writers Guild Award-winner and two-time Emmy Award nominee, Sharon lectures extensively on essay writing. Sharon teaches students how to master interview skills, write resumes, and transform their goals, dreams and experiences into memorable college application essays. She works with students everywhere: in-person, by phone, FaceTime, Skype and email. Visit my website for more info. Connect on Google+, Pinterest and Twitter. Do you have questions, or want to schedule a personal coaching session? Get in touch! Fill in the comment section so I can answer you as completely as possible. Thanks! Categories: Application Process, College Essay - Planning, College Essay - Writing, Writing College Supplements | Tags: how to start with action in college application essays, How to write the college application essay personal statement, writing the college application essay | Permalink. How do you start your college essay in an interesting way? So how do you make your first paragraph interesting? Easy. Grab the reader’s attention. Entice him into wanting more. Create intrigue, excitement or suspense, so she’s excited to learn how your story turns out. You’ll almost always find success. Just know three solid writing techniques and choose the one that’s best for you. 1. Start Where Your Action or Conflict Begins. There are two kinds of action or conflict: 1. Physical and 2. Mental. Don’t make this mistake: Some students start their stories at the very beginning chronologically—like the day they started school or came down the stairs on Christmas morning. That’s like starting a fairy tale at “Once upon a time.” (“Once upon a time there were deep dark woods and all the creatures who lived there, and the woods were very scary…”) You’re forced to wade through tons of description before you get to the interesting stuff—like when Little Red Riding Hood meets the wolf or the witch shoves Hansel into her oven. Shove Hansel into the oven right away—start where the action begins. Hot Tip: If you’re not sure where your action begins, write your story from beginning to end and then find the place something interesting starts to happen. It’s often several paragraphs from the beginning. Fantastic! This is a vivid, energetic snapshot of the E.R. There’s both physical action (the gurney being wheeled) and mental conflict (the student doesn’t want to pass out). The student transported us into his world. Did you notice the student’s new sentence doesn’t mention he’s an intern, in Seattle, or even that he’s in a hospital? Explain your background information later in your essay. This writing technique works! (Think about it—would you want to see a movie after your friend just told you the whole story?) 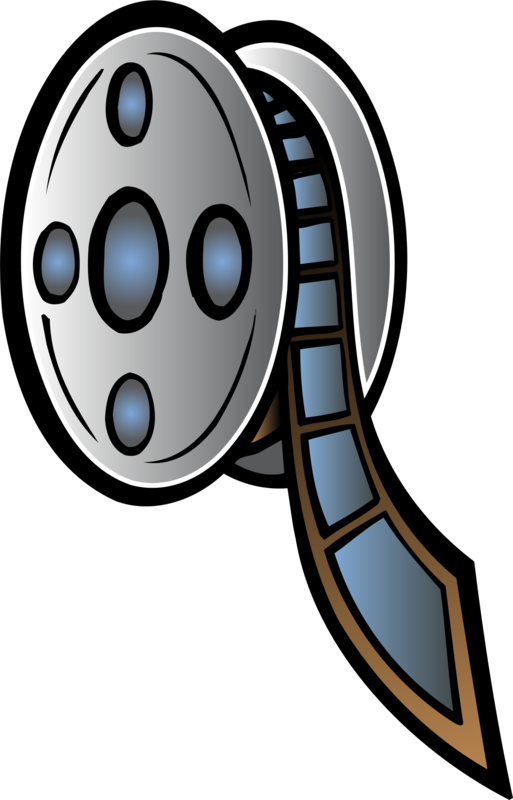 By revealing your story as you go along, you create suspense and excitement for the story to come. You’ll make you reader WANT to keep reading to find out more. 2. Start With an Intriguing Statement. Starting with an intriguing statement works well if your essay has less action and focuses more on your point of view or the way you think. Try it. When you read the examples I gave you above, did you want to know why the student stopped giving up or why someone would hate to take showers? If you said yes, then you’ve been hooked by the power of an intriguing statement. The technique here is simple: When you ask a question your reader will automatically keep reading to see how it all turns out. And that’s mission accomplished. Start with action, a question, or an intriguing statement. Grab your reader’s attention right away. You’ll be on your way to an interesting and memorable college application essay. Editor’s Note: This post was originally published in July 2015 and has been revamped and updated to include additional information and examples. Sharon Epstein is owner of First Impressions College Consulting in Redding, Connecticut. She’s a Writers Guild Award-winner and two-time Emmy Award nominee, teaching students around the world how to master interview skills, write killer resumes, and transform their goals, dreams and experiences into memorable college application essays. I work with students everywhere: in-person, by phone, Skype, FaceTime and email. Visit my website for more info. Connect on Google+, Pinterest and Twitter. Do you need more help, have questions, or want to schedule an appointment? Get in touch! Fill in the comment section so I can answer you as completely as possible. Thanks! Categories: College Essay - Writing, Writing College Supplements | Tags: first impressions college consulting, how to start a college application essay inn an interesting way, How to write an interesting college application essay, sharon epstein, writing the college applicaiton essay | Permalink. Are you a writer who likes adjectives and long sentences? Then you may need to work at editing your essay down to the prescribed length. But while you’re cutting out adjectives don’t cut out the specifics, which help make your essay unique and interesting. For example, let’s say you’re writing about overcoming your fear of flying. The sentence “I had always been afraid of flying” is good. But “I had always been afraid of flying, ever since a turboprop came too close to my family’s car” is more specific and evocative. However, “I had always been afraid of flying, ever since that hot summer night when a buzzing turboprop heading in for a landing came too close to my family’s car” adds adjectives that you probably won’t have room for. Even if the question doesn’t state it specifically, the school always wants to know how you’ve been affected by the experience or event you’ve just written about. So use your conclusion not to summarize, but to show what you’ve gotten out of the experience — how it changed you, how it shaped your goals, etc. If you’ve followed step #3, then you’ve probably got a pretty strong ending. But I know how it is – several schools x several short essays adds up to a lot of essays, fatigue sets in and time gets short, and it’s easy to look for shortcuts. But never bail on the ending. Make sure it’s well-written and reflects well on you. Remember that the ending is the last impression your college admissions reader will have about your essay – and you. 5. Do: Stay within word count. College admissions readers have a lot to read. Categories: Writing College Supplements | Tags: college application essays, college essay advice, college essay coach, Common Application personal statement, first impressions college consulting, how to write the common application short essay, sharon epstein | Permalink.